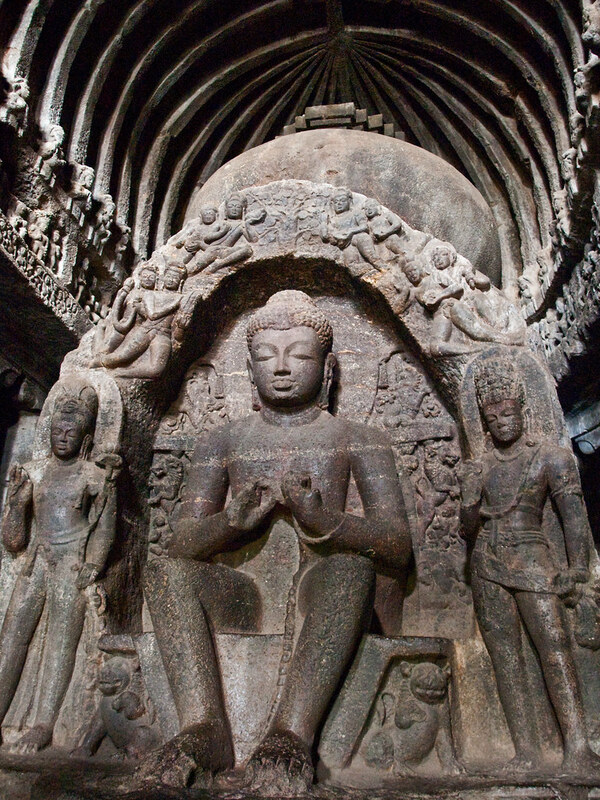 Two thousand two hundred years ago work began on an extensive series of cave monuments in Maharashtra, India. 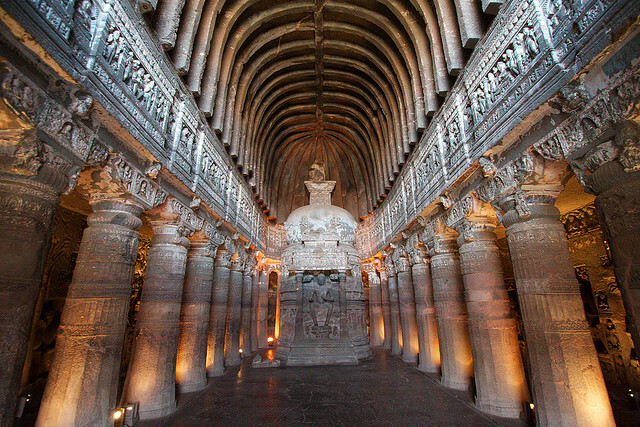 Over a period of hundreds of years, thirty one monuments were hewn piece by piece from the rock face. Then, some speculate around the year 1000AD, they fell in to disuse. 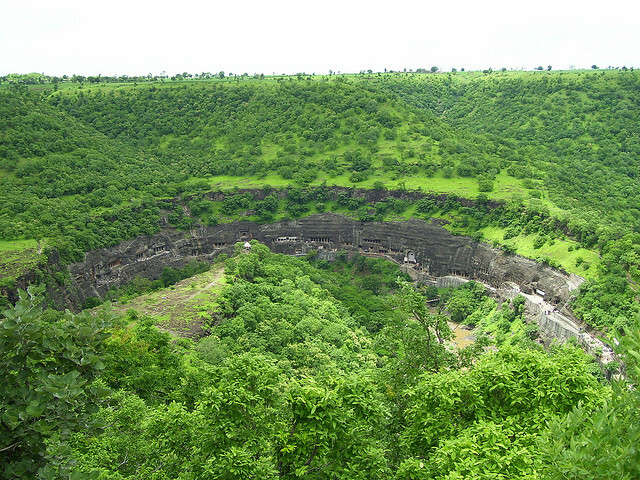 Dense jungle grew around, hiding the caves away from human eyes. 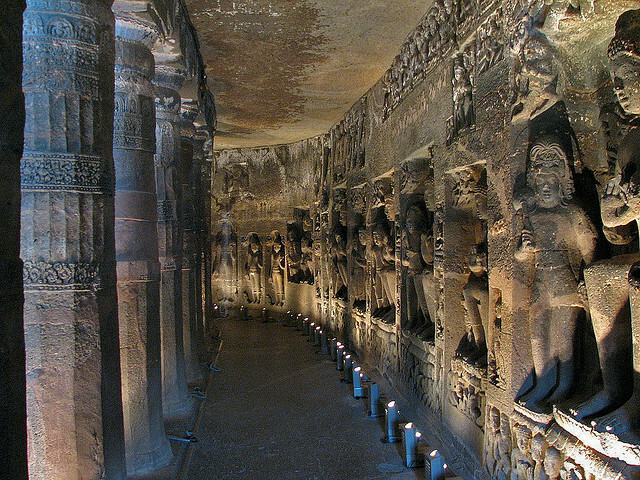 They Ajanta caves lay undisturbed for hundreds of years. Then, in April 1819, during the time of the British Raj, an officer with the unassuming name of John Smith came rediscovered a doorway to one of the temples. He had been hunting tiger – something of which many would disapprove today but his next step was disrespectful in the extreme. He vandalised one of the walls with his name and the date, something which is still visible today. One can only imagine what went through Smith's head when he made his find. Such a rediscovery did not remain secret for very long. Soon, European and Indian tourists were thronging to the site – after extensive tidying up. After all, the caves had been home to bat, birds and larger animals for hundreds of years. 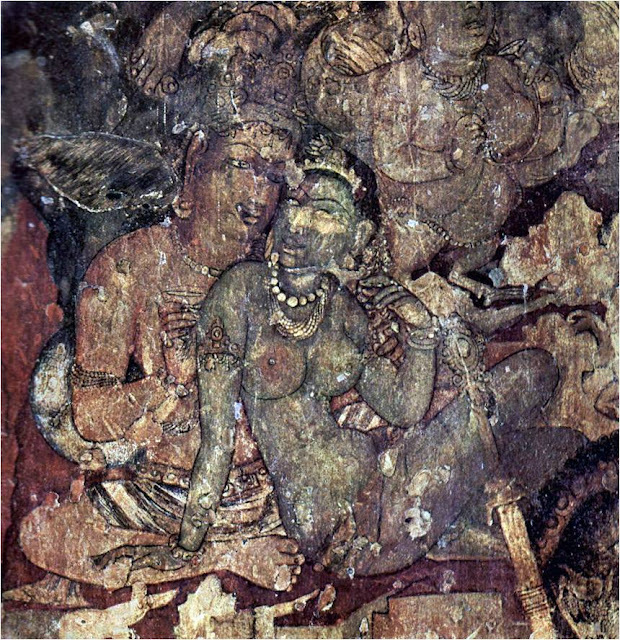 The Ajanti Caves had been returned to the world of the living. 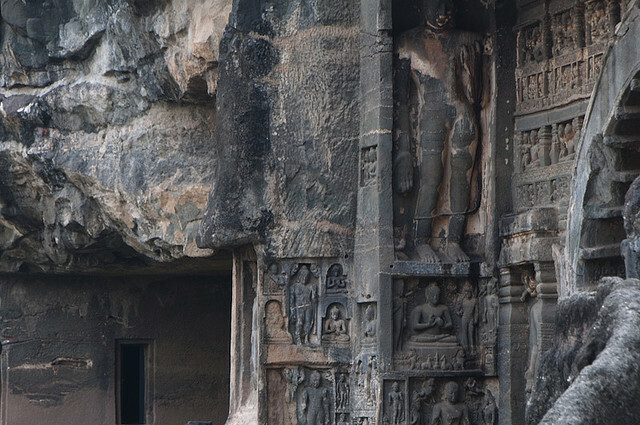 The nearest human habitation is Ajinṭhā, a tiny village a few miles away from the caves. 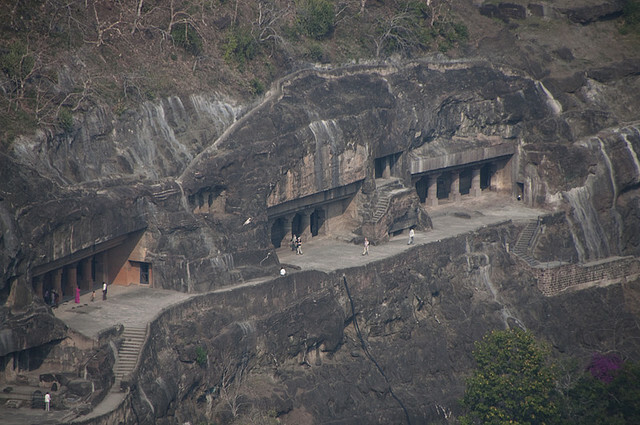 The sanctuaries, which are known as chaytia-girhas date from the second century before Christ. 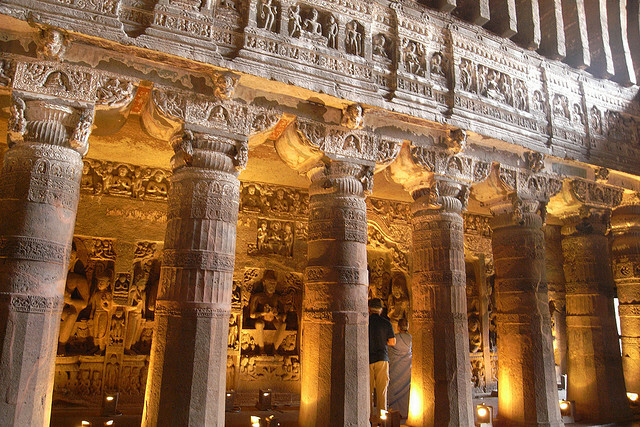 They were used primarily as prayer halls and are similar to an extent to the contemporary Roman designs of arch and column. 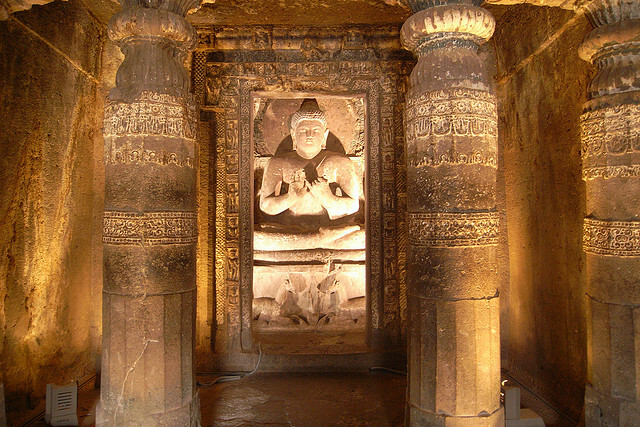 However, these sanctuaries were carved from the immense rock face of the caves, with chisels and, indeed, bare hands. 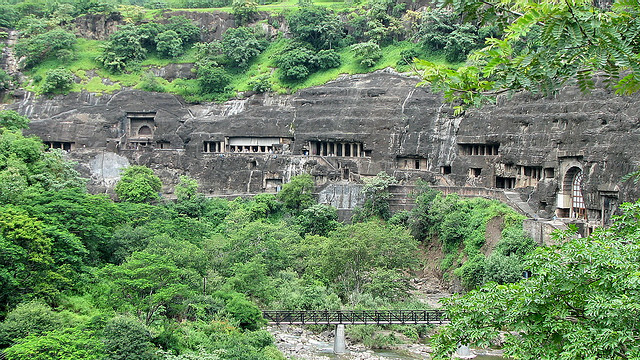 The first caves were hewn from the bare rock at the time of The Sātavāhana Empire which started around 230BC. 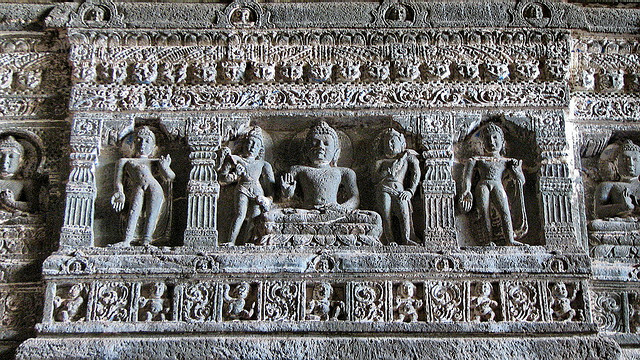 The Sātavāhanas brought peace to India after several foreign invasions and the decline of the previous, Mauryan Empire. It is not without irony, then, that they were rediscovered by a contemporary invader and representative of a foreign empire. 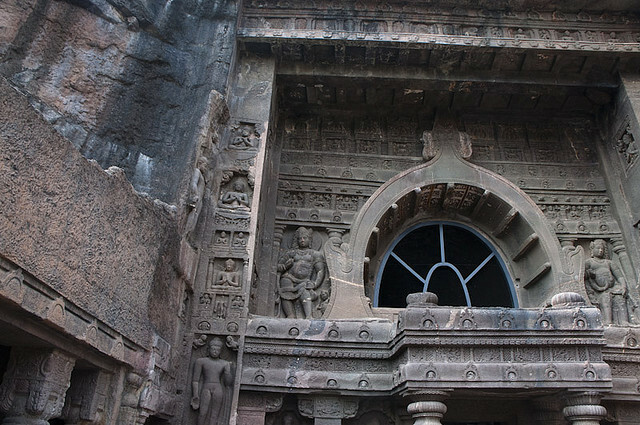 Although there is widespread debate about the time at which the second period of building took place most now agree that it was probably during the reign of Harishena, from 460AD and over a period of around twenty years. 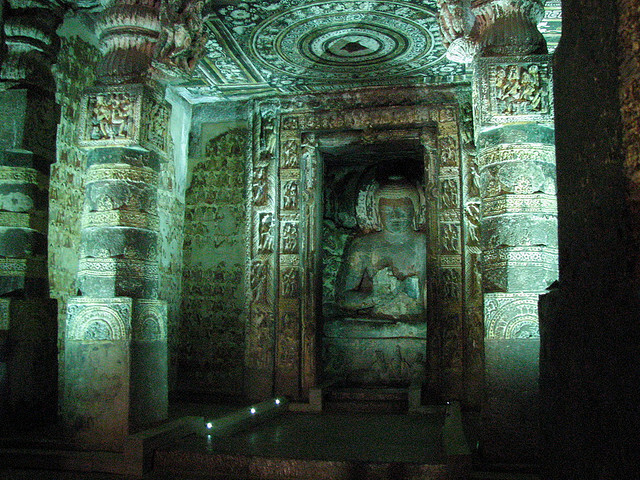 This architectural flowering saw the creation of twenty temples which were used as monasteries. 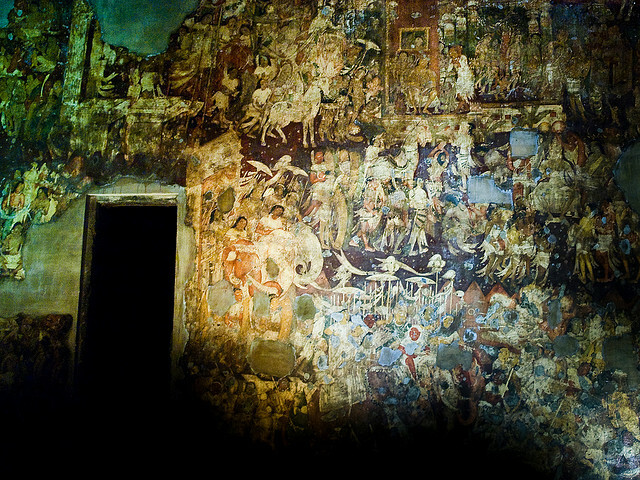 There are paintings everywhere – literally. Every surface apart from the floor is festooned with narrative paintings. Time has taken a serious toll on these marvelous works with many parts simply just fragments of what they were when first created. 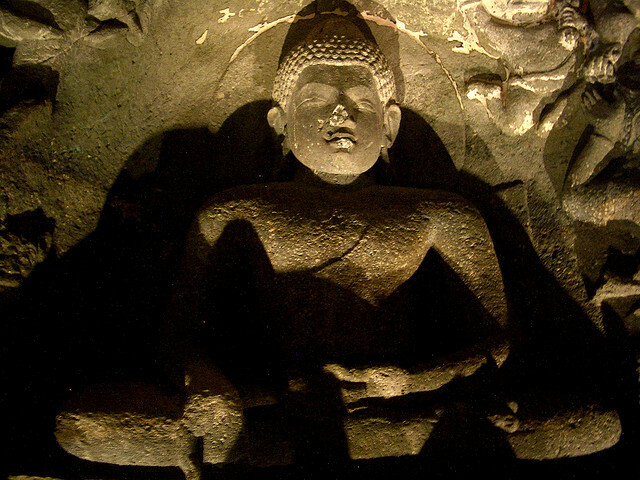 The stories are almost wholly devoted to Jātakas – tales of the Buddha’s previous lives. 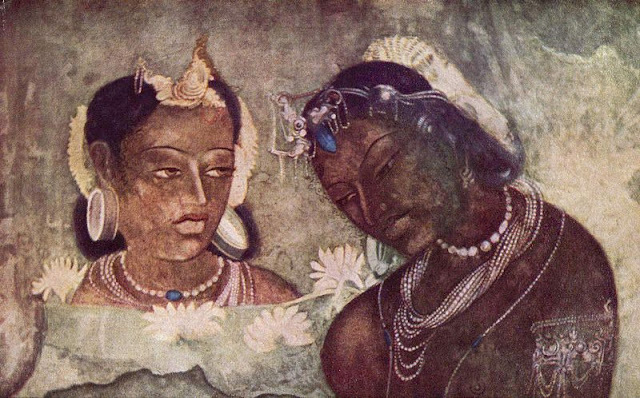 These 547 poems were painstakingly and lovingly painted on to the walls by devotees. They were created using an ancient method. The surface was chiseled so it was rough and could hold plaster which was then spread across the surface. Then the master painter would, while the plaster was still wet, commence his work. 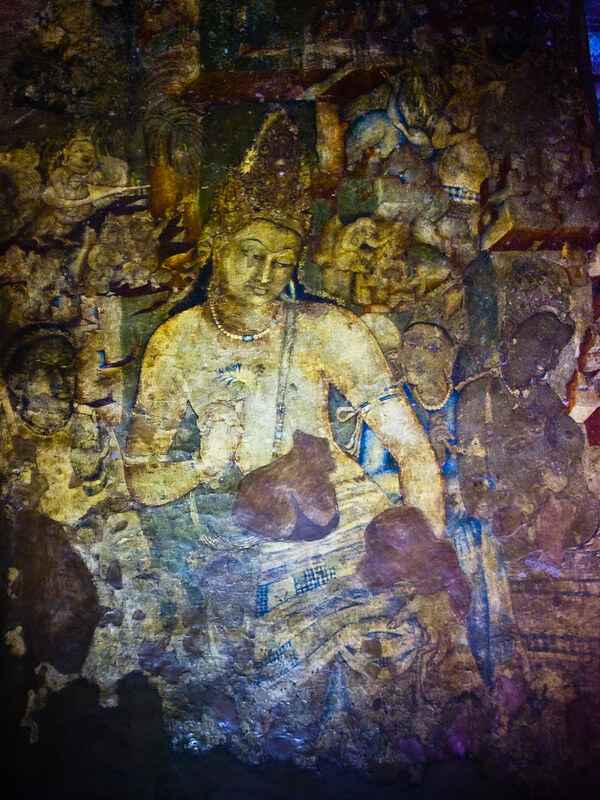 The colors soaked in to the plaster and so became a part of the surface. 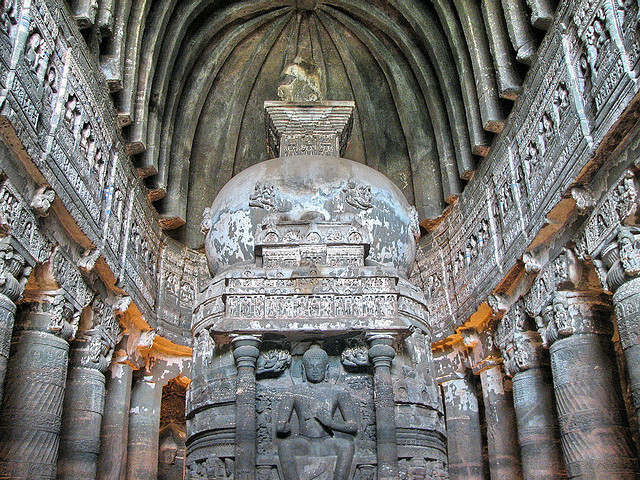 Although this meant that it would not peel off as easily, perhaps not even the painters foresaw the temples persevering for over two thousand years. 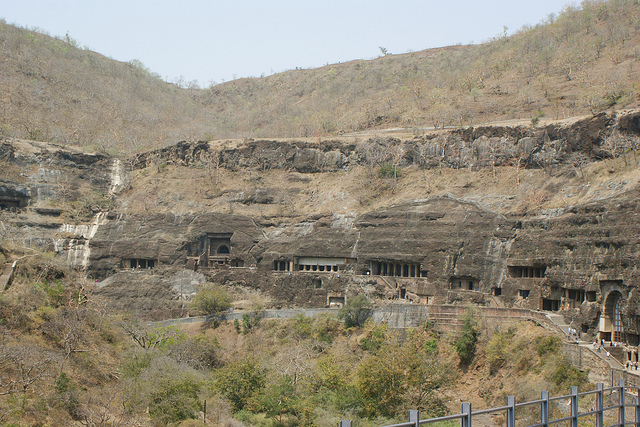 No one knows for sure when and why the caves were abandoned – whether it was a gradual desertion of some event of political and social magnitude took place which precipitated the neglect and final vacation of the site. Yet for hundreds of years the place remained forsaken, to be rediscovered that fateful day in 1819 by John Smith.